Missouri Living Will Form - What is a Living Will? A Missouri Living Will Form is a written legal document that outlines how physicians should handle life-prolonging treatment if you become incapacitated and unable to speak. The Missouri Living Will makes it possible for you to state your wishes in advance about health care procedures if you are in a terminal condition. When drafting a Missouri Living Will, you disclose and define your medical treatment wishes in advance for a time in the future if you are unable to communicate because of an illness or injury. Your wishes must be based on your own personal values and expectations. You need to consider all hardships and burdens on your family, and your quality of life if you are seriously ill and in a coma or vegetative state. 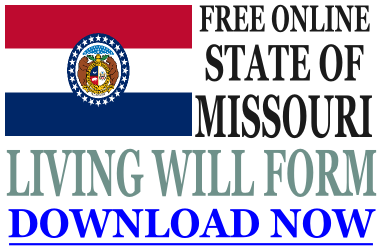 Fill out and print a free Missouri Living Will form in just minutes online. When preparing a Living Will in Missouri, first you will need a blank Missouri Living Will Form. You can view a sample one here online for free. After preparing and signing your Living Will, you want to make sure that copies are distributed. You should keep the originals safe but easily accessible. You’ll want to provide copies of your Missouri Living Will Form to your physician and to a Medical Power of Attorney, if you have one. Important: Inserted with your original documents, you really need to keep a list of who has copies. You also may want to discuss your Missouri Living Will and other health care plans with your loved ones and family members. This will be a tough discussion, particularly if they do not agree with your plans, but it’s best to notify them beforehand and go over any of their concerns. If you are a frequent traveler, you may want to keep a copy of your Living Will Form Missouri with you in the event that you fall seriously ill or unconscious during your trip. Keep it safe along with your passport and other identifying documents. Resuscitation– You likely already know about cardiopulmonary resuscitation/CPR, but resuscitation may also include using electric shock – the procedure used if your heart has stopped beating. Your Missouri Living Will determines the conditions for which you want to be resuscitated. Food and Water – If you are gravely ill or permanently unconscious, you will not survive without food and water. Unless you specify that food and water should be withheld, medical professionals will use intravenous (IV) feeding or tube feeding to provide you with nutrients to survive. While IV feeding is a temporary solution, tube feeding can be administered indefinitely. Palliative (Pain) Care – If you do not wish to have life-prolonging treatment, you do not need to pass in pain. Palliative care involves medications that can help you remain as comfortable as possible until life ends naturally. Ventilation – A mechanical ventilator can help you breathe if you are unable to do so, and you should consider if you want to use a ventilator, in what circumstances, and for what period of time. All of this can be declared in your Missouri Living Will form. Organ and Tissue Donation – If you are an organ donor, it is ideal to specify which organs and tissues you might wish to donate in your Missouri Living Will form, even if you have it denoted on your driver’s license or in estate documents. Why? Because some organs and tissues require you to be on life-prolonging treatment until the organ or tissue transfer is complete. Donating Your Body – If you plan to donate your body for research, you may want to contact local medical schools or body donation programs to find out what details you need. You should then specify that in your Living Will for Missouri. A Missouri Living Will Form should also address whether you wish to receive drugs for treatment, including antibiotics, if physicians should continue with dialysis in the event that your kidneys fail, and many other circumstances. If you are planning to create a Living Will for Missouri, it is a very good idea to consult with a physician and an estate planning attorney about what your options are so they can answer any questions you may have. Ultimately, don’t forget that you can change or revoke a Missouri Living Will at any point. If you learn of a new medical diagnosis, your wishes may change depending on how you feel about the diagnosis and the course of treatment. You might also want to change your Missouri Living Will if you change your Medical Power of Attorney, particularly if your marital status changes. Sometimes people simply have a change of heart about how they feel their incapacitated care should be handled, and that’s fine too. These are difficult decisions to make, and they do not need to be permanent. You may even want to take time to review them every four or five years to ensure they are in line with your values.